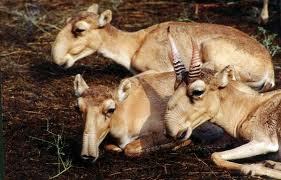 The saiga antelope, a relic of the ice age fauna, originally ranged great areas of the earth including the British Isles. It had been largely wiped out by the 1920s though by the 1950s, saiga populations had recovered to around two million animals centred on the Russian steppes. After the collapse of the Soviet Union, saiga populations fell rapidly again as a result of uncontrolled hunting and the demand for the horns within the Chinese medicine community - exacerbated by the fact that the World Wildlife Fund, among other groups, disastrously recommended it as a substitute for rhinoceros horn. Since only male saigas have horns, their hunting threatens species survival. At the present time, it is estimated that 50,000 animals remain. Since 2002, the Saiga Antelope has been listed as Critically Endangered on the IUCN Red List of Threatened Species (IUCN, 2002) and has been listed in Appendix II of the Convention on International Trade in Endangered Species of Wild Fauna and Flora (CITES) since 1995. It is also listed in Appendix II of the Convention on the Conservation of Migratory Species (CMS or Bonn Convention).